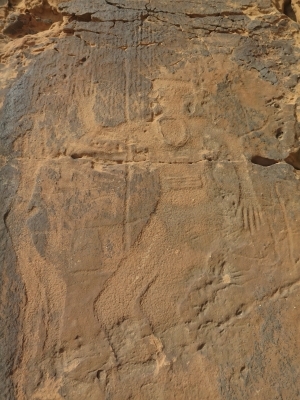 Rock Art in the Hail Region of Saudi Arabia covers two sites with petroglyphs and inscriptions northwest and south of the city of Hail. Hail Rock Art is one of the easier places to visit in the Kingdom. I wanted to come a day earlier but got stuck on a road leading into the dessert which I guess I wouldn't know without reading an Arabic sign or there wasn't a sign and they assume everyone will pass this area with a 4WD. No point in talking about it more but if you are coming from the southwest you have to get to Hail first, then turn west. If you are coming from Riyadh then it's clear how to drive anyway. There are two locations, one in the far south of Hail but it's in the middle of nowhere so the choice was clear: Jubbah. I also inquired at the National Museum in Riyadh about a permit and they told me to find someone in Hail but actually that's not true. I think the term “permit” in the KSA means more like “get an official guide who arranges everything”. So I got to the Jubbah site in the morning and the signs are very clear to find it. There was a huge tourist bus with a few Asian tourists standing nearby and I thought after a week of no foreigners I would get hit by an annoying tour bus from SE Asia or something but it turns out it was just 5 friendly Thai guests and their tour guide uses the massive bus for any tour group size. I walked into the administration building thinking it is a visitor center and the admins invited me to breakfast and tea, talked about what I am doing in the KSA and what I want to see in the area. It's important to say you are really looking forward to the rock art, which I suppose I was, I also talked a lot about Vision 2030 which they enjoy hearing, and they organized a guide to take me into the area. The Thai group were also inside already and we merged into one group of 2 guides. With some translation issues I helped and quickly turned into what they called a “guide” as well, although grasping what the Saudi guides were saying doesn't make me an expert and I'm happy to pass on my understanding to the other group members. Sorry, way too much personal trip stuff. 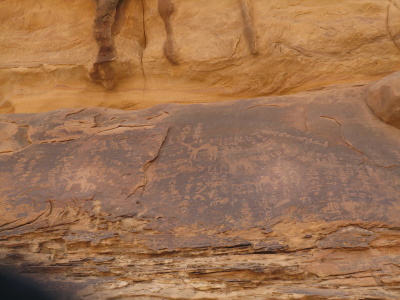 The rock art in the starting area is interested but mainly animals. Surely what is important that whereas camels are still around, many animals were hunted to extinction in Arabia. I find important how the rock art is a history book. The Thai group were elderly but I was able to climb around the rocks with the guide to get close-ups of serval amazing art including an “Egyptian” posing king. The area is still under minor construction but a new path leading all the way around the site has already been completed. It is very far and the guides took us to the second gate by roads. Without a guide one wouldn't find most of the rock art. Again, climbing gets you to the the best areas. 3 Community Members have visited.